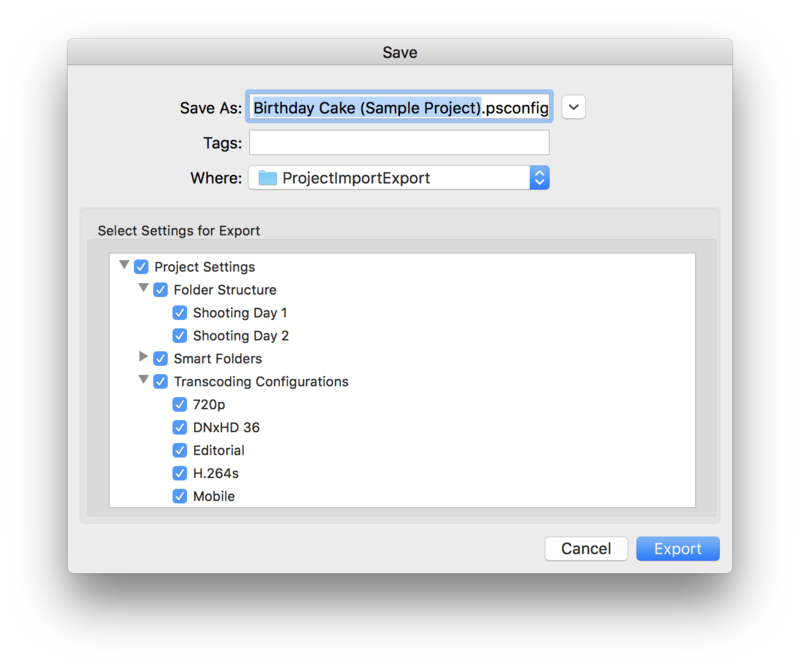 Silverstack allows to export and import project settings to transfer them to new projects or different machines. This can e.g. help to move project settings from established projects to new projects to avoid setting up from scratch. Other use cases involve the transfer of transcoding configurations from Silverstack XT or Lab to new projects or other machines. Which Settings Can Be Transferred ? The settings transfer involves certain project based settings as well as global settings. Find the settings that can be transferred below. 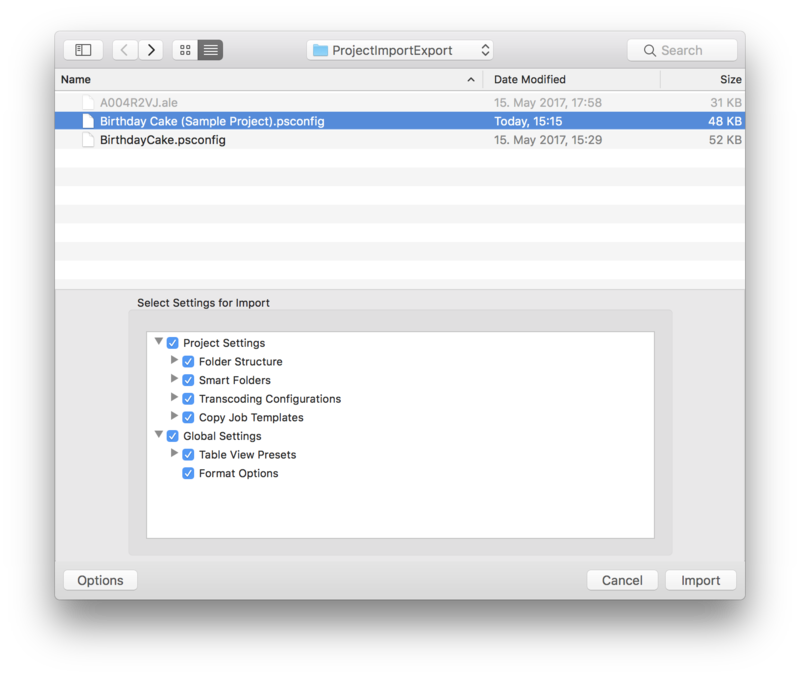 Folder Structure: Transfer the folder structure of your Silverstack library to a new project. All top level folders can be selected for the export. Smart Folders: Transfer your custom smart folders to a new project. Copy Job Templates: Transfer your custom copy job templates saved in the offload wizard to a new project. Table View Presets: Transfer your table view presets (of the main table of clips and metadata) to a new project. 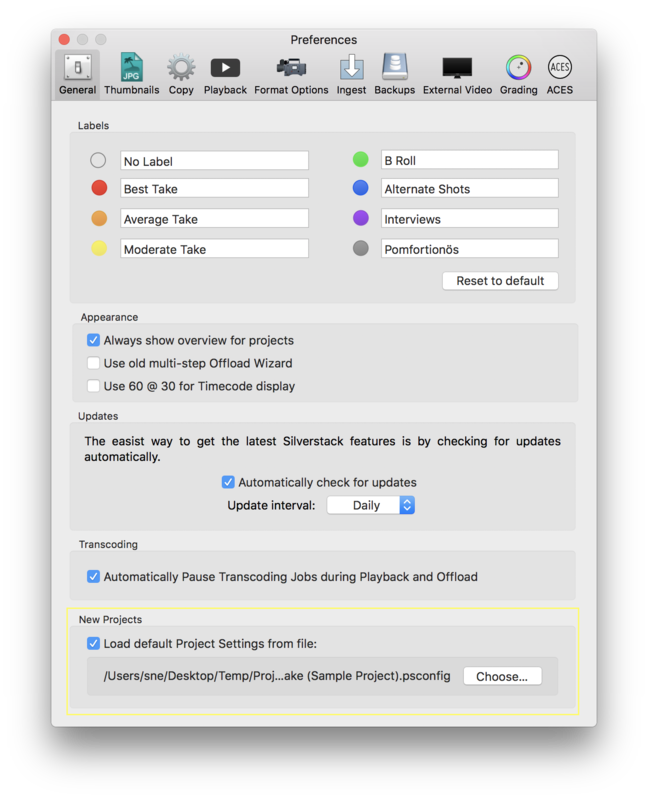 Format Options: Transfer the settings of the “Format Options” in the Silverstack preferences to a new project. Click “Export” to save the .psconfig (project settings configurations) file containing the project settings information to the selected destination. The export and import settings windows are symmetrical hence you can choose which content to write to the .psconfig file as well as which content to import from a .psconfig file. Additionally to the export and import of project settings you can define a .psconfig file that should be used as a template to create new projects. First export a project settings file as described above and include all the settings the default template for new projects should contain. Then go to the Silverstack preferences by choosing “Silverstack/Silverstack Lab > Preferences…” in the Main Menu. Fig. 5: Choose the .psconfig file the default project settings for new projects should be loaded from. When you now create a new project in the toolbar or from the “File” menu (“File > New Project…”) all contents of the selected .psconfig file will be loaded as default for the new project. Attention: Please be aware that the .psconfig file in this location will overrule the UI settings. The .psconfig files are generally compatible throughout the different Silverstack versions Silverstack, Silverstack XT and Silverstack Lab. Please be aware though, when importing transcoding configurations from Silverstack Lab into Silverstack XT that restrictions due to incompatible features such as e.g. DNx transcoding only available in Silverstack Lab might apply. *Only available for Silverstack XT and Silverstack Lab as the basic version of Silverstack does not support custom transcoding configurations.